An old favorite with new styling. Our Click Gel III (TM) pen offers the smoothest writing with effortless ease. 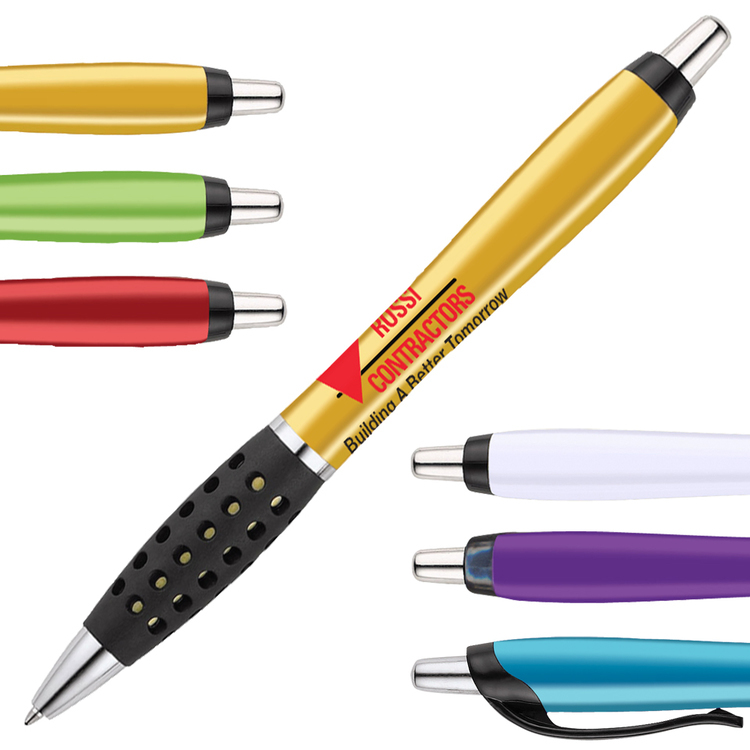 With ink color that matches the barrel, these cool writing instruments make great giveaways at tradeshows, conferences and conventions. 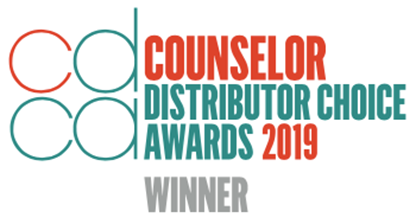 Choose from the four vibrant color options, add your company name or logo and have them readily available in the classroom or at the front desk. What a colorful way to promote virtually any business! Retractable gel ink pen offers the smoothest write with effortless ease. With smooth writing PREMIUM FLUID ink, this DGP Classic pen will become an instant classic with your clients. 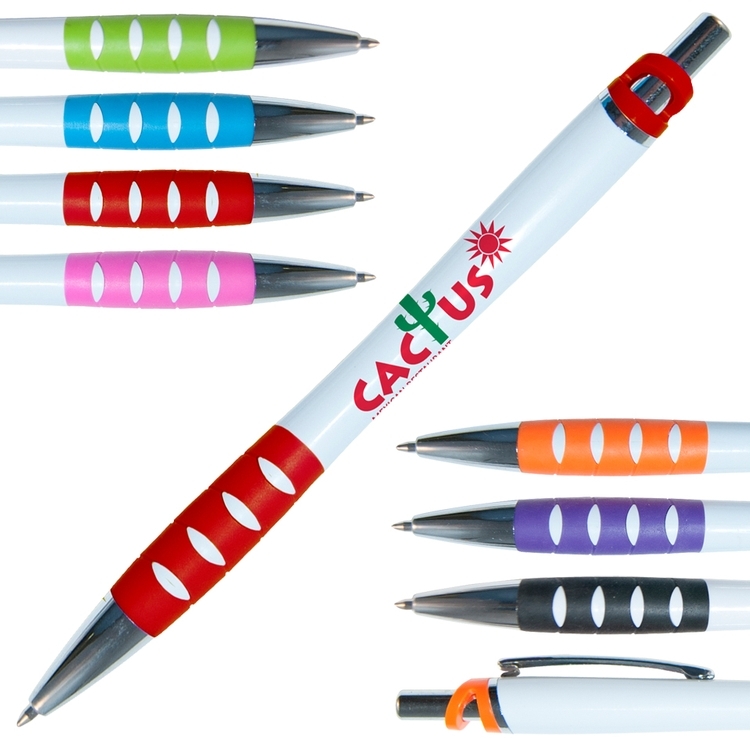 Available in 8 different opaque barrel colors and accented with chrome trim, the large imprint of this pen will show off even the most difficult of logos to print. Medium 1.0mm Retractable Ballpoint Pen with blue writing ink (black writing ink available in the white barrel). This stick pen features a medium 1.0 mm point with blue ink. Perfect for any company sponsored event. This pen is a simple and effective way to connect with your consumers long after the event has ended. Customize with your business name and logo to effectively promote your business. 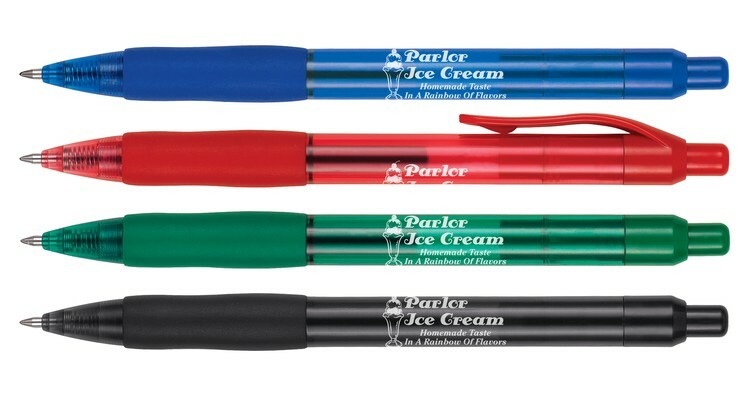 Other color caps and pens colors are available when the factory is contacted (minimum order may be required). Don't miss out on this helpful tool! 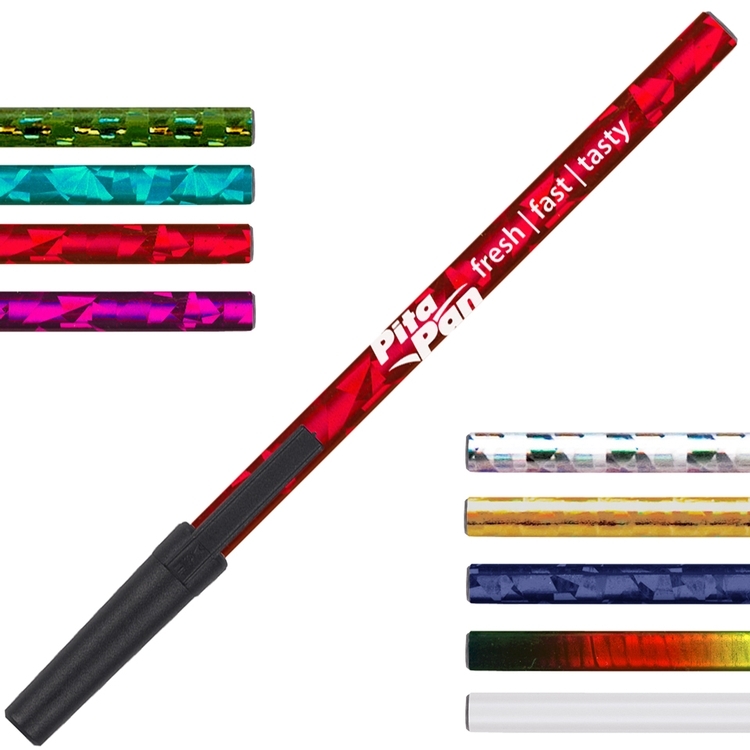 Stick pen comes in point style medium 1.0 mm, and blue colored ink. At first glance our Inklings (TM) appear to be pencils, but are in reality our returning favorite Ballpoint Arrowhead pens. The unconventional design of this handy writing tool features barrel versatility and imprint options with the function and long life of a fine pointed pen. With a medium 1.0mm point and the choice between blue or black non-erasable ink, this is ideal for educational institutions. The eraser is for cosmetic purposes. Medium 1.0mm ballpoint pen with non-erasable ink, made to look like a pencil. You're on the "write" track! 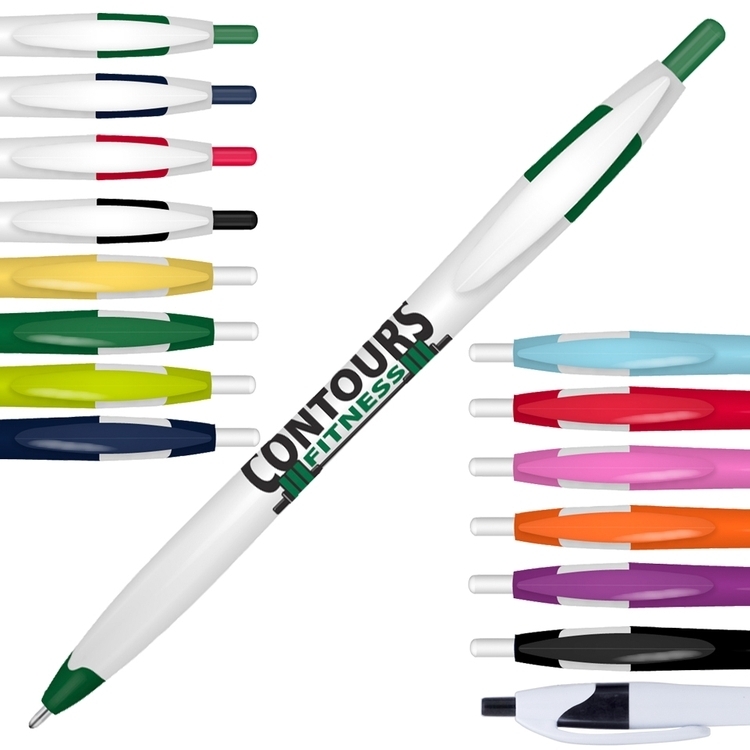 The Kontour (TM) pen features a retractable design, medium 1.0mm ballpoint, blue ink, a white barrel and accenting colored trim, making it an excellent promotional product for virtually any business. A handy writing instrument that's shaped for comfort and ease. This pen would also work well as a giveaway at tradeshows, conferences and conventions. Perfect for banks, insurance companies and schools too! 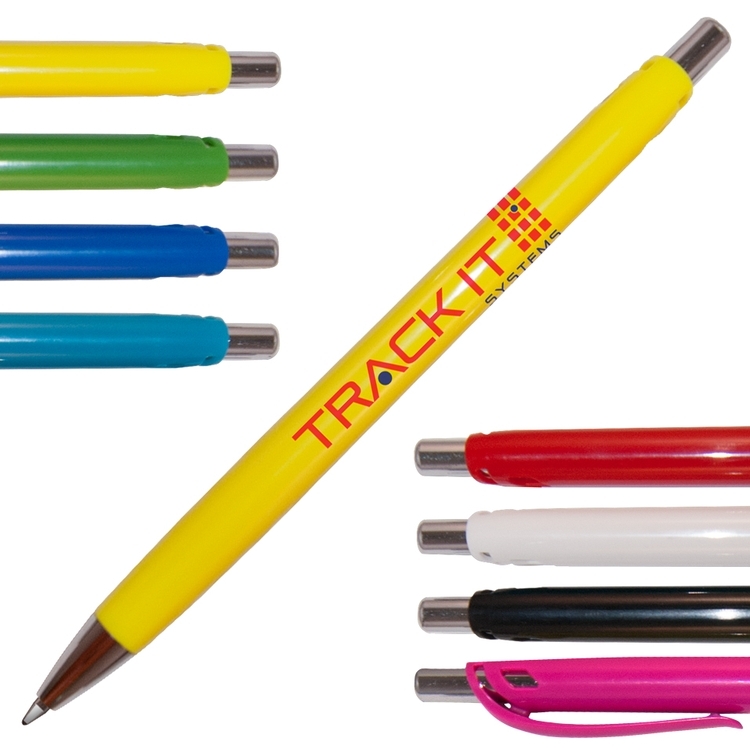 Retractable ballpoint pen shaped for comfort and ease of use, with colored trim. If you're looking for a stylish pen that writes smoothly then you need the Cosmopolitan pen! 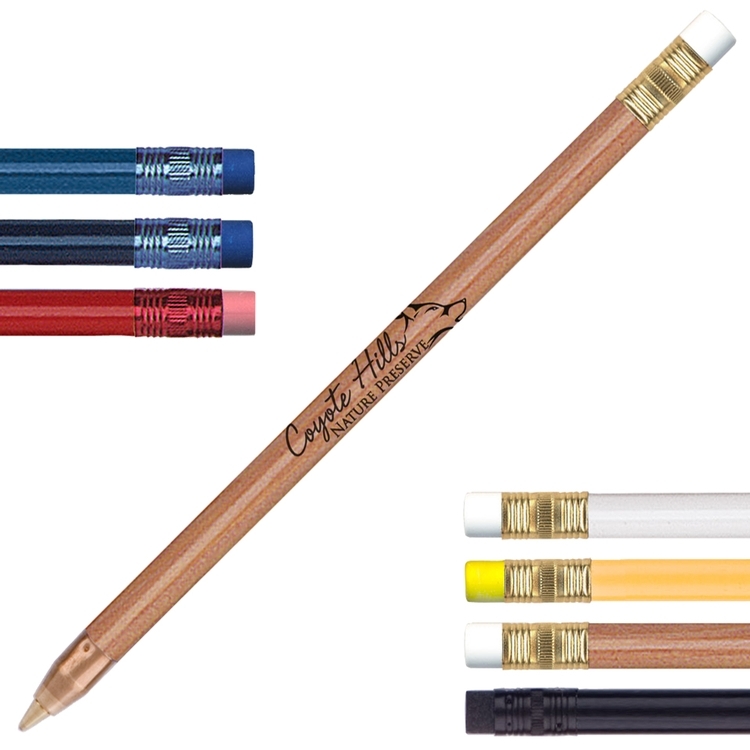 This colorful writing instrument features a unique design, medium 1.0mm point, blue or black ink, colored barrel and silver trim. 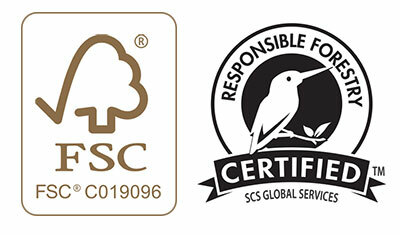 It is an excellent promotional product for virtually any business. With a comfortable grip and matching clip, this would also work well as a giveaway at tradeshows, conferences and conventions. Perfect for insurance companies! Worldly retractable pen with stylish good looks and smooth write, blue ink.